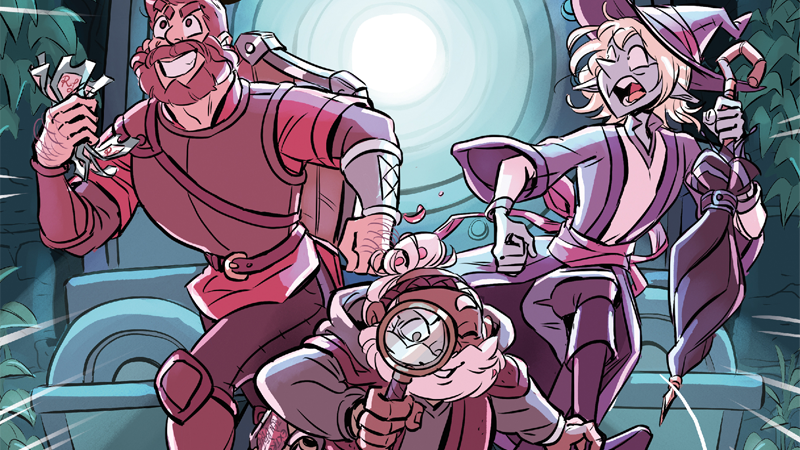 There’s a murder to solve in Magnus, Merle, and Taako’s next comic adventure! Reuniting the McElroy family—brothers Griffin, Justin, and Travis, and father Clint—with Carey Pietsch, the co-adaptor and illustrator of the first comic, Here Be Gerblins, First Second’s next Adventure Zone graphic novel is Murder on the Rockport Limited, an adaptation of the podcast’s second campaign storyline. The story follows the party of human Fighter/Rogue Magnus Burnsides, dwarven Cleric Merle Highchurch, and elven Wizard Taako as their quest takes them aboard the titular Rockport Limited train line—only to find themselves wrapped up in a murder mystery aboard the train they must work together to solve before it arrives in the city of Neverwinter. Excited? Well, get even more excited, because io9 is proud to reveal this 15-page sample from the book below. Check it out! The Adventure Zone: Murder on the Rockport Limited is written by Clint McElroy, Griffin McElroy, Justin McElroy, Travis McElroy, and Carey Pietsch, and illustrated by Carey Pietsch. The Adventure Zone: Murder on the Rockport Limited is set to hit shelves July 16, 2019. If you want a copy, you can check out where to preorder the book right here.